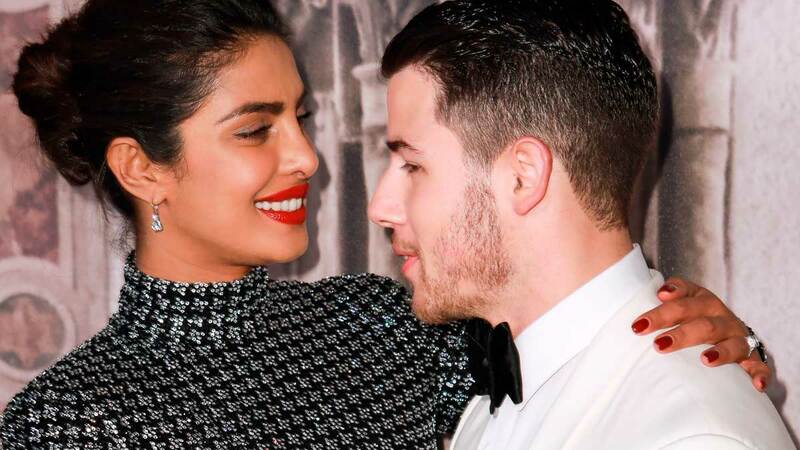 Remember when Priyanka Chopra posted those pictures of her and Nick Jonas hanging out in India this week and we were all like, "OMG is the wedding happening this soon!!!?" It looks like we were on track because they just officially began their wedding ceremonies with a traditional puja ceremony at Priyanka's mom's home in Mumbai, and my heart can't handle it. In Hinduism, a puja is "is the act of showing reverence to a god, a spirit, or another aspect of the divine through invocations, prayers, songs, and rituals" and is often part of domestic ceremonies. For their puja, Nick wore a blush-toned kurta pyjama and Priyanka wore a beautifully embellished blue kurta with a matching pink floral design and a dupatta shawl. Nick's brother Joe Jonas was also there with his fiancée, Game of Thrones actress, and Priyanka's "J Sister," Sophie Turner, so you know the wedding is in full swing now. And according to an E! source, "they all seem to be great friends and enjoy being together." Nick and Priyanka will have a few more traditional ceremonies, like the Sangeet, Mehendi, and Haldi ones, leading up to their official Hindu wedding ceremony at the Taj Umaid Bhawan palace that will (finally) take place over the weekend. They're also rumored to be having a Christian ceremony afterward on December 3. In the days leading up to the wedding, Priyanka shared some fascinating tidbits about her relationship with Nick, including his hilariously formal opening line. Apparently, Nick asked her out with a LinkedIn-style text that read, "I think we should connect." Which, LOL. Hopefully Nick ditches the formalities at their wedding and they have a ton of fun!